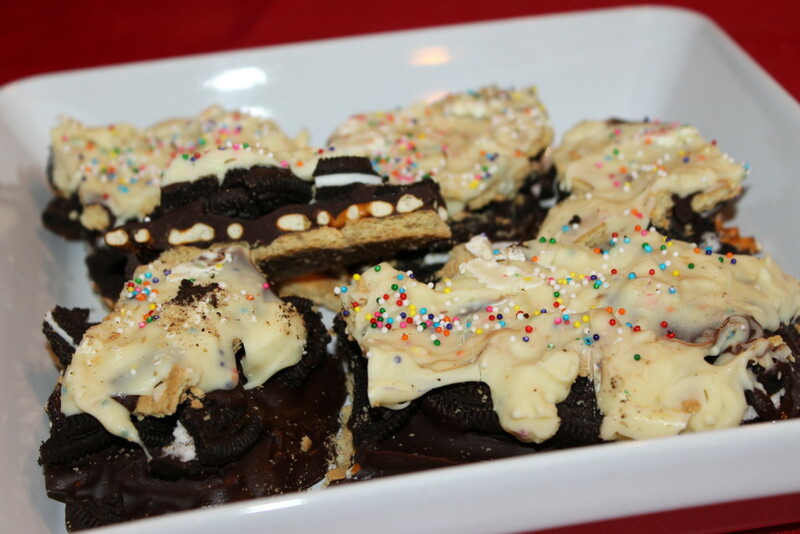 7 Layer Bark is layer upon layer of Graham Crackers, Pretzels, Oreos, Chocolate, and of course Sprinkles — giving you a mouthful of deliciousness in every bite! Tonight is the biggest night for the Hollywood world. Glitz and glamour will take over our screens as we tune in to The 87th Academy Awards. I have not been to the movies in ages, so unfortunately I really have no idea who or what is up for any of tonight’s awards. But I love the entertainment of it all, and especially love checking out all the Best and Worst Dressed! The Academy Awards, or The Oscars, are a great excuse for throwing a little soiree and treating your guests to award-worthy recipes. And that’s exactly what #SundaySupper is bringing you! We’re having our own Red Carpet Party, hosted by Katie of Ruffles & Truffles! We’ve all heard of (and eaten our fair share of) 7 Layer Bars. These bars go by many different names — the classic 7 Layer Bars, Magic Bars, Hello Dolly Bars, Gooey Bars. Whatever you want to call them, they are abso-freaking-lutely delicious and deserve a permanent spot in everyone’s easy dessert repertoire. But I’m making things even easier. You don’t even have to turn on your oven to make this 7 Layer Bark! 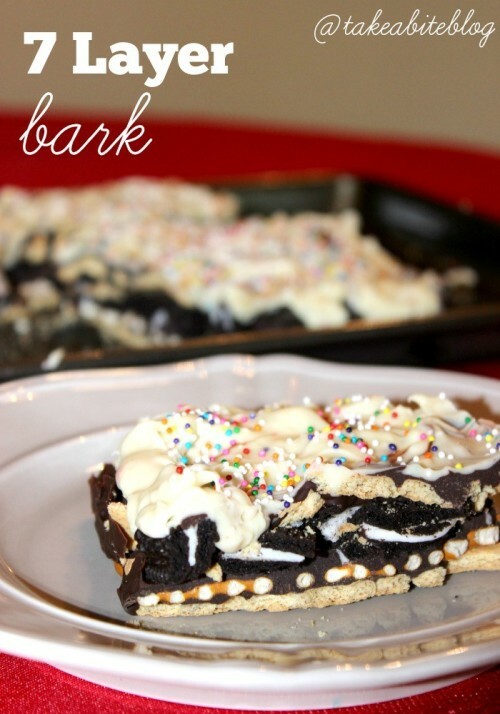 Go ahead and call it Magic Bark if you want, because it is pretty magical, but I’m sticking to a name that says it all. I want everyone to know there are SEVEN layers of incredible treats in this bark. 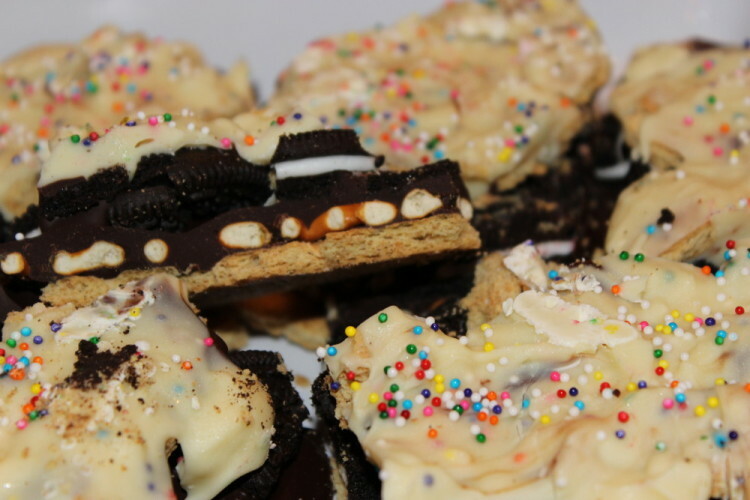 Golden delicious honey graham crackers line the bottom, followed by salty pretzel squares, then we’ve got lots of broken-up Oreos (you could use any flavor Oreo here for some added oomph), then we crush up graham crackers and sprinkle over top of the Oreos. Then we melt good quality dark chocolate and pour it over all that Graham Cracker-y, Pretzel-y, Oreo-y concoction we’ve got going on and stick it in the freezer to set. Once that layer of chocolate is good and firm, we melt white chocolate and spread it — because melted white chocolate doesn’t really pour as easily as regular chocolate does — as evenly as possible over the dark chocolate. It’s okay if the warm white chocolate melts some of the dark chocolate and cause the colors the mix. It will create a fun swirl of chocolate and no one will argue against that! To top it off, we add colorful sprinkles. Everything is better with sprinkles. Duh. 7 Layer Bars hardly take any time at all to make. Quick — go get all your ingredients and make these for your Oscars Red Carpet Party tonight. Make extra to hide in the back of the fridge for later, because I can tell you from experience, there will not be leftovers. Prepare a baking sheet with aluminum foil. 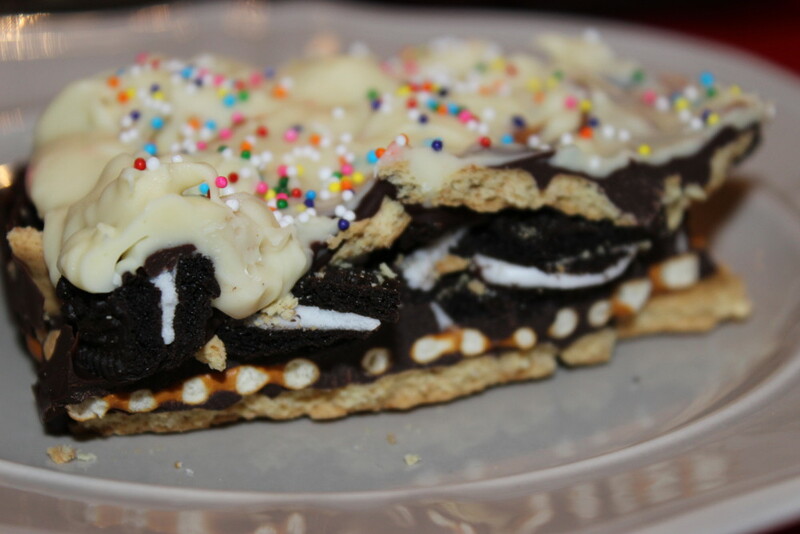 Arrange the graham crackers on the foil, followed by a layer of pretzels. Break up more graham crackers with your hands and sprinkle over the pretzels. Melt the dark chocolate bark in a microwave-safe bowl, heating for 30 seconds at a time. Pour over top of the crushed graham crackers. Break up the Oreos with your hands so they are still rather larger pieces. Immediately place the Oreo pieces over the melted chocolate while it is still hot. Melt the white chocolate in a microwave-safe bowl the same way you melted the dark chocolate. Take the bark out of the freezer and use a rubber spatula to spread the melted white chocolate on the crushed Oreos. Place in the freezer to set for at least an hour. Use a mallet (or a hammer) to break up the pieces before serving. That is seven layers of awesome! Oooh, how fun would it be to make a version with all movie snacks! Hmm, you’ve given me an idea! Ohhh that sounds like a great idea. Can’t wait to see what you come up with! Oh my! You just took bark to a whole new level…love it! SO much deliciousness in every bite! Irresistible!!! It really is, I couldn’t stop eating it! This is decadent and delicious looking!! Woof…love that bark! That is truly fit for a special occasion!!! I’d like some of this now! It looks so good. I want more, too. Gotta make another batch! A great Oscar night snack! Saving a batch in the back of my fridge is a MUST!!! 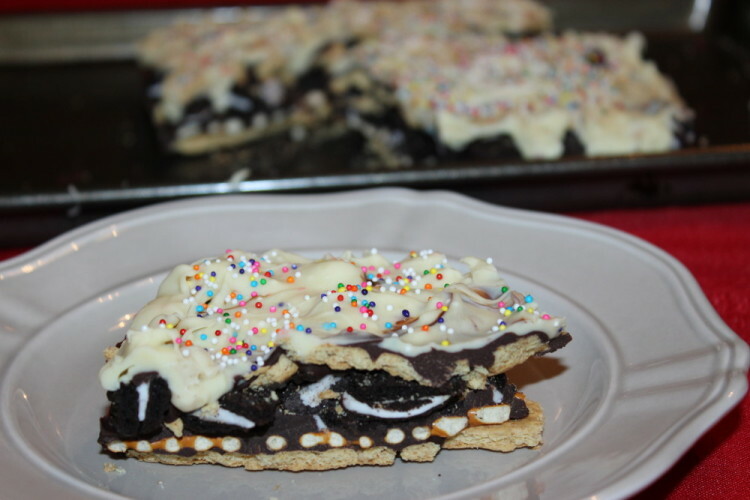 7 layers of deliciousness that you don’t have to bake….Thanks!!! That’s the idea, Wendy, genius isn’t it?! You’ve taken all of the best movie watching treats and put them together! Awesome. This just looks ridiculously DELICIOUS!!!! mouth watering…. Wow, that is some crazy layering going on! I love it for its “over-the-top-ness”! Just one scrumptious layer after another piled together in an awesome sweet treat. Whoaaaa…. this would never make it out of my kitchen! These are unbelievable, I can’t wait to make them in my kitchen!! Be warned…they will not last long!